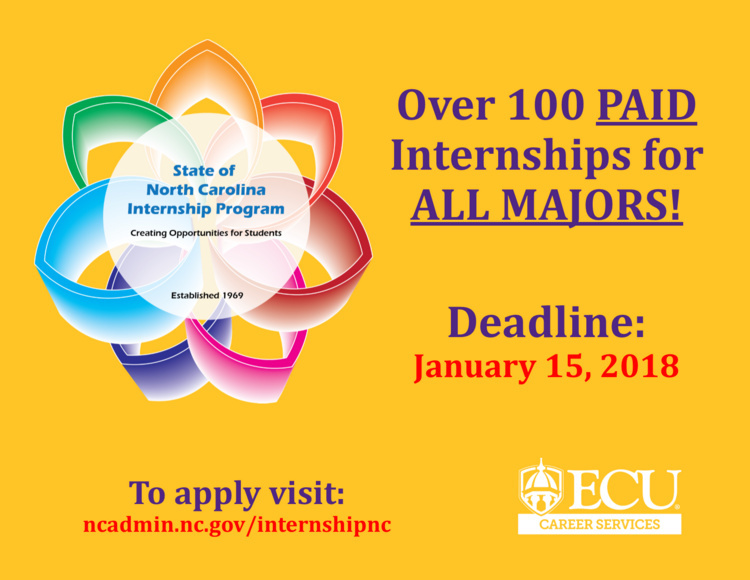 The State of North Carolina Internship Program is offering paid summer internship opportunities in state government agencies. Applications for the Summer 2018 State of North Carolina Internship Program are now being accepted. The 2018 State of North Carolina Internship Program booklet (attached) can be downloaded from our website at www.youthinvolvement.nc.gov (Click on State Internship Program). The booklet (available in PDF format) contains all program details, including the full listing of available internship positions and application instructions. Applications are to be submitted ONLINE only. Please visit https://ncadmin.nc.gov/internshipnc to apply. Once you have submitted an application online, you will be instructed to email the supplemental information to nccfw@doa.nc.gov.